As we come to the end of 2014, many of us will be finalizing the OSHA 300 and 300A recordkeeping forms to share with employees in early 2015. OSHA considers these summaries of workplace injuries and illnesses, including ergonomics-related strains, important for discovering workplace issues and for tracking progress in solving them. The data are most commonly used in two ways: first, to calculate incidence and severity rates so progress can be compared year-to-year or to other companies. The second way is to highlight areas where incidents have taken place so more in-depth analysis can be done. The benefit is in finding out the causes of the incidents and fixing them before more occur. This can be very helpful for many organizations. And the simplification of the recordkeeping rules by OSHA in 2001 helped a lot to improve the accuracy and usefulness of the OSHA recordkeeping data. But, these are minimum requirements and there are a lot of good opportunities to explore to reduce incidents further. Relying solely on the OSHA logs for incident analysis has been criticized for two main reasons. First, using this data is considered to be “reactive”, or reacting to incidents after they have occurred. Many consider this to be like “closing the barn door after the horses have gotten out”. Second, the information collected is often not sensitive enough to tell us much or show clear patterns or risks. As a result, people may become frustrated that their limited resources may not be solving the underlying problems. So, how does one become more “proactive?” And, how can we use our resources more effectively for the real sources of incidents, especially ergonomics-related strains? Employees need to feel free to report issues early without a perception they will be criticized for doing so. Management needs to have procedures in place to encourage these reports, to process them in a timely way and to get back to the employee to show progress. Even if the issue needs more research or evaluation, getting word back to the employee is important to show they have not been ignored. Employees need to work with management on identifying and implementing fixes both in the near term and longer term. For instance, pilot tests are often a great way to test and refine an approach before implementing it more widely. A formal process for reporting “potential hazards.” These are situations where an incident has not occurred, but it could under the right circumstances. Employee input early in design projects or equipment purchases. This can have major impact to avoid potential issues “before the ink is even dry”. One of the main values of being “proactive” is it can result in reporting of issues before they become OSHA recordable cases. The issues are almost always less severe, easier to treat and treatment is more effective, especially with ergonomics-related strains. In addition, evaluating issues early can uncover production problems and inefficiencies. Correcting them could lead to improved productivity, better product quality and reduced production costs. In this economy, that helps everyone – employers and employees. So, as you get ready for 2015, remember the value of effective OSHA injury and illness recordkeeping. At the same time, a focus on proactive measures can improve effectiveness even more for finding and improving workplace issues. 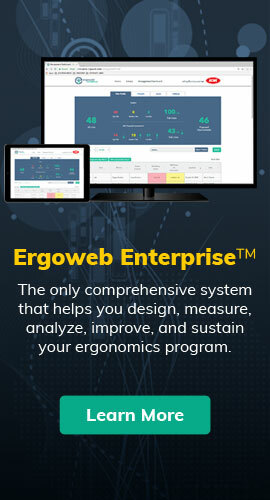 It’s a great way to reduce or minimize ergonomics-related strains while improving productivity and quality. For more information, talk to your health and safety staff or other professional who can help get you started. Steve Gutmann is an accomplished occupational safety and health professional with over 30 years experience in the field. Steve is president of S. H. Gutmann Consulting, LLC, providing services in the areas of ergonomics and safety and health management system performance. Prior to consulting, he worked at 3M for 22 years in the Corporate EHS group with particular interest in implementing effective ergonomics programs. Steve is a Certified Professional Ergonomist (CPE) and Certified Industrial Hygienist (CIH). He can be reached by e-mail at [email protected] or by phone at 651-334-9638.